"I can't thank you enough for this post, last year I tried to make fudge and I ... read full review"
Making homemade fudge is a holiday family tradition in many households. The fudge is made to be enjoyed by family members but is many times given to others as a gift during the holidays. Fudge consists of butter, sugar, milk and flavoring agents such as chocolate, white chocolate, butterscotch, pumpkin, vanilla, and maple. 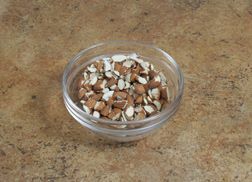 Many recipes also call for the optional use of nuts such as walnuts, pecans, almonds, cashews, and pistachios. Making smooth and creamy fudge can be a challenge at times. With the many different fudge recipes available, you may have to experiment with several to see which one works best for you. The basic fudge instructions below show how to achieve the smooth and creamy fudge you desire. Follow these instructions and you should have some great fudge to share with family and friends. The pieces of equipment shown below are items that will aide in the success of making fudge. Select a heavy bottom saucepan with straight sides. 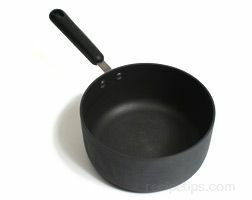 To protect against boil overs, be sure to select a saucepan that holds at least 3 times the volume of ingredients. 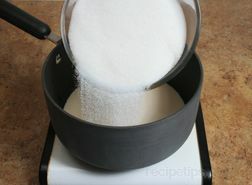 Be sure to use a heat proof bowl to hold the ingredients to which the boiling sugar syrup will be added. The bowl needs to be able to handle temperatures of at least 235°F. 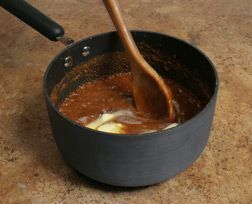 A wooden spoon works well when stirring the boiling sugar mixture. 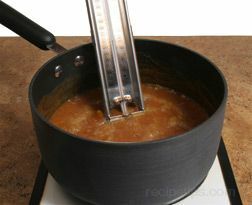 It can tolerate the temperatures it will be exposed to and it is nice and sturdy for stirring the thick fudge. A heat-proof spatula can be used but be sure it is safe to use with temperatures of 235°F or higher. 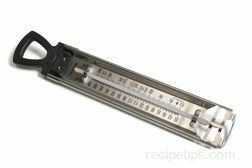 A candy thermometer is used to verify that the sugar mixture is boiled to the proper temperature. This is important to achieve the desired consistency of the fudge. Fudge can be made without the use of a candy thermometer but there will be a higher risk that the fudge will become grainy. 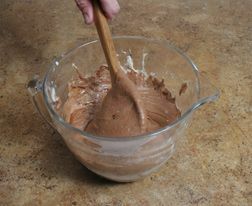 Prepare a pan for pouring the fudge in when it is done. 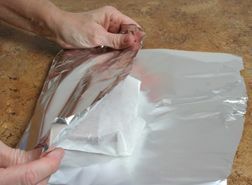 Use a glass or aluminum pan and line with foil. 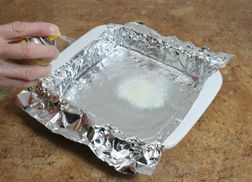 Spray the foil with butter flavored cooking oil or coat lightly with butter. 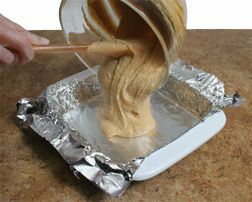 The foil will make it easy to remove the fudge from the pan. Once it has set, just lifting it out of the pan by holding on to excess foil on the sides. Experience may be one of the best tools for fudge making. For those who do not have the experience, there are some tips to keep in mind when making fudge. The tips below may help you be successful even on your first batch. Use good quality butter when making fudge. Do not substitute margarine because it contains more water and can prevent the fudge from setting up properly. Also, be sure to follow the recipe closely as to the quantity of butter that is called for because too much butter can also cause a problem with the fudge getting firm enough. Look for recipes containing marshmallows, marshmallow creme, or corn syrup. These ingredients will help prevent the sugar from crystallizing and causing grainy textured fudge. Be prepared before you begin. Measure all ingredients out and get out all the equipment and utensils you will need. You need to be attentive to what you are doing during every step and be able to react when necessary. Use a candy thermometer to check the temperature of the sugar mixture as it is boiling. The temperature should reach at least 234°F but no higher than 238°; then it should be removed from the heat. 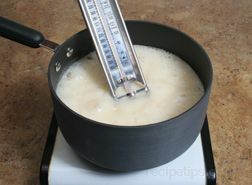 Boiling the sugar mixture to the proper temperature is important in achieving the right water content, which will affect the firmness of the fudge. Boiling to 234°F will remove most of the water content from the sugar mixture. Test your thermometer for accuracy before using. See How to Test a Candy Thermometer. If you do not have a candy thermometer, the best method to use to determine that the sugar mixture is at the proper temperature is the cold water test to determine when it is at the soft-ball stage. See below for instructions on how to test for the soft-ball stage. Drop a little of the boiling syrup into a glass of cold water. 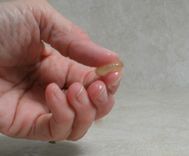 Remove a few of the drops of syrup and rub between your thumb and forefinger. If it forms a small ball that can be easily flattened between your fingers, it is at the soft-ball stage and should be removed from the heat. 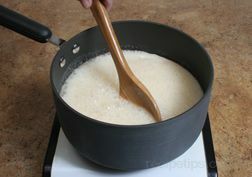 If the drops dissolve or just form threads between your fingers, the sugar syrup has not reached a soft-ball stage and needs additional boiling. If the drops form a firm ball that resists flattening or hard ball, the syrup has boiled too long. For more information on testing the different stages of sugar, see How to Test Stages of Sugar Cooking. 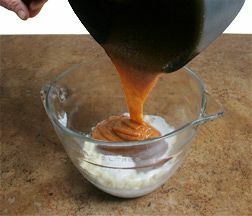 Place your flavoring ingredients into a separate bowl and pour the sugar syrup into these ingredients. Do not scrape the sides of the pan or you may be scraping the sugar crystals into the flavor ingredients, which would cause the fudge to crystallize. There are many additional ingredients that can be added to provide different flavors to the fudge but it does not have to have anything else added to be good. See the tips below on added additional ingredients. Some of the ingredients that can be added are different types of nuts, marshmallows, raisins, dried fruit, peanut butter, M & M candies, or pieces of your favorite candy bar. If you are going to experiment with the addition of other ingredients, be sure to keep in mind that you have to be careful of the water content of the ingredient you are trying. If it is going to add water or moisture to your fudge, do not use it. You can add a combination of ingredients but be careful that they compliment each other and that you will not be taking away from the flavor of the fudge itself. 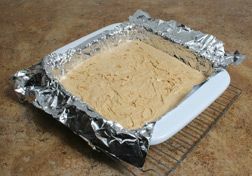 When transferring the finished fudge to the foil lined baking pan, do not scrape the sides or bottom of the pan as you are pouring it in. This will help prevent getting any sugar crystals that may have formed along the sides or bottom from getting into the fudge. When the fudge is done, allow it to slowly cool down. Cooling it too fast may cause the sugar to crystallize, causing the fudge to be grainy. Follow the recipe closely. Add ingredients in the order stated and follow all directions carefully. There are other flavors besides chocolate that can be used for fudge but chocolate is the most common flavor used. There are also different varieties of chocolate that are used to achieve different levels of chocolate flavor. Some of the common flavor ingredients and describe below. Semi-Sweet Chocolate Chips - Semi-sweet chocolate chips are considered a medium chocolate and are probably the most common flavoring agents used for making fudge. They are the base for other levels of chocolate. 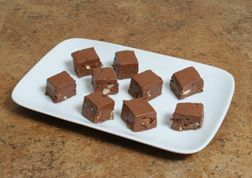 Milk Chocolate Chips - Use half semi-sweet and half milk chocolate chips to create milk chocolate fudge. Other ingredients do not need to be adjusted. Unsweetened Chocolate - For a richer dark chocolate, add 2 oz. of unsweetened chocolate to the semi-sweet chocolate chips. Do not reduce the quantity of semi-sweet chocolate chips and the other ingredients do not need to be adjusted. Vanilla Chips - Substitute vanilla (white) chips for semi-sweet chocolate chips in equal quantity to produce vanilla flavored fudge. When substituting the white chips, also reduce the amount of butter by 2 tablespoons. Peanut Butter Chips - Substitute peanut butter chips for semi-sweet chocolate chips in equal quantity to produce a peanut butter flavored fudge. When substituting the peanut butter chips, also reduce the amount of butter by 2 tablespoons. Butterscotch Chips - Substitute butterscotch chips for semi-sweet chocolate chips in equal quantity to produce butterscotch flavored fudge. 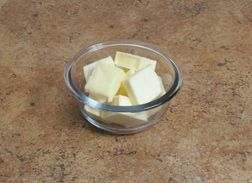 When substituting the butterscotch chips, also reduce the amount of butter by 2 tablespoons. 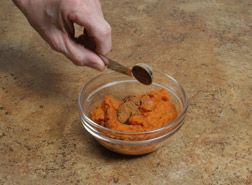 Pumpkin - Use canned pumpkin to make pumpkin flavored fudge. Follow ingredients and recipe directions when making pumpkin fudge. See Pumpkin Fudge below. 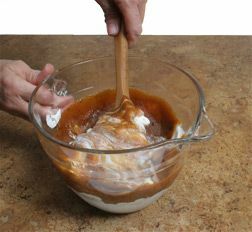 Extract Flavorings - There are many extract flavorings besides vanilla that can be added to the fudge. Because extract is such a concentrated flavor be careful when adding. Measure carefully because a little too much can have a big affect on the flavor of the fudge. Be sure, when selecting a flavor, that you select one that compliments the flavor of the type of fudge being made. 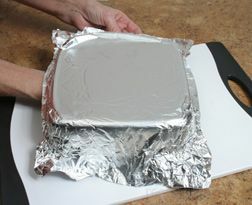 Prepare a 9 x 9 inch baking pan by lining it with foil. 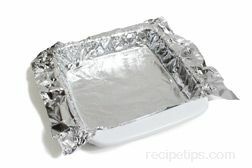 Allow a little excess foil and then spraying the foil lightly with non-stick cooking spray. If the spray gets too heavy, blot with a paper towel to remove excess. Set the prepared pan aside until the fudge is done. In a heat-proof bowl, place the chocolate chips, marshmallow creme and vanilla. Set this bowl aside. Note: be sure this bowl is large enough to hold the remaining ingredients, which will be added later. Measure out the almonds and have them ready to add later. Leave them whole or chop them if desired. Have the butter cut up into smaller chunks so that they will melt faster when added. 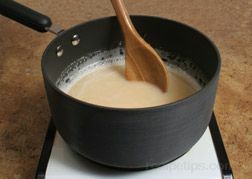 Pour the evaporated milk into a saucepan, warm slightly, and then add the sugar. Over medium high heat, bring the milk and sugar mixture to a full boil. Be sure to stir continuely. Use a wooden spoon that has been sprayed lightly with non-stick cooking spray for best results. Once the mixture comes to a full rolling boil, turn the heat down to medium; be sure to maintain a rolling boil. Place the candy thermometer into the pan. Boil until the mixture reaches 234°F on a candy thermometer. Stir gently throughout the entire boiling time. Note: If you do not have a candy thermometer, allow the mixture to boil for 7 or 8 minutes but do not exceed 9 minutes. 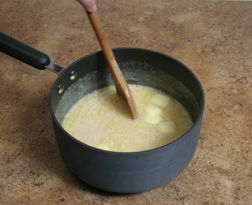 Once the mixture reaches 234°F, immediately remove it from the heat and add the butter. 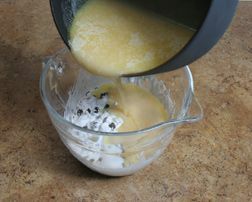 Stir just until the butter is melted and then discontinue stirring. 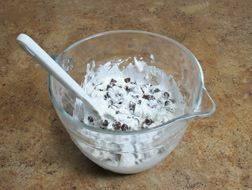 Pour the hot mixture into the bowl with the chocolate chips, marshmallow creme, and vanilla. Do not scrape the bottom or sides of the pan when pouring into the bowl. 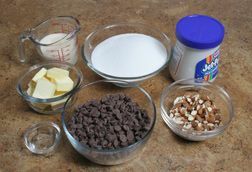 Stir all these ingredients together until the chocolate chips are melted. 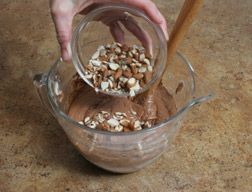 Add the almonds and still until evenly mixed and the fudge begins to loose its glossiness. Pour the fudge into the prepared pan and spread out evenly. Allow the fudge to cool completely at room temperature. Once cooled, it is ready to cut. 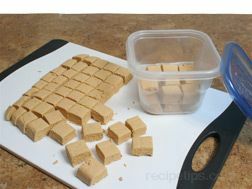 Note: To make the fudge a little easier to cut into squares, chill it in the refrigerator for a while after it has been completely cooled at room temperature. 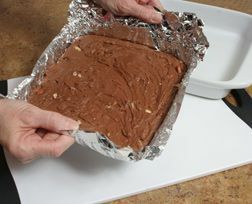 Remove the fudge from the pan by lifting it out using the excess foil on the sides. Flip the fudge over and place it on a cutting board top side down. 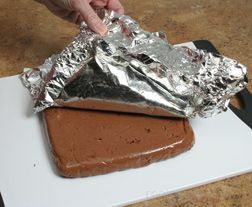 Peel off the foil and cut the fudge into 1 to 1 1/2 inch squares. Begin by cutting into 1 to 1 1/2 inch wide horizontal strips. 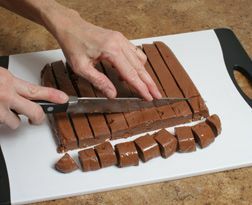 Then make 1 to 1 1/2 inch wide cuts, perpendicular to the first cuts, to create squares of fudge. 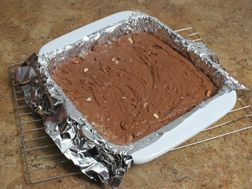 The fudge is then ready to enjoy or to be packaged up and given as gifts. When making fudge, be sure to follow whatever recipe you are using very closely. It will make the differance in whether or not you are successful in your efforts. In a heat-proof bowl, place the marshmallow creme, white chocolate chips, and vanilla. Set this bowl aside. 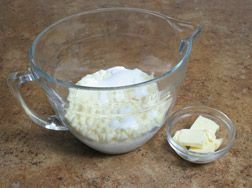 Measure out the butter cut up into smaller chunks and set aside to be added later. Also measure out the pumpkin and add the cinnamon and pumpkin pie spice to it so they are ready to be added when the milk and sugar begin to boil. 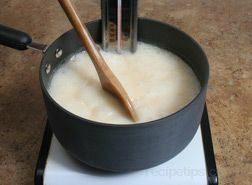 Over medium high heat, bring the milk and sugar mixture to a full boil, stirring continuously. 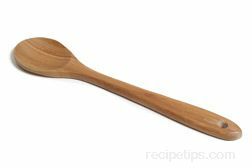 Use a wooden spoon that has been sprayed lightly with non-stick cooking spray. 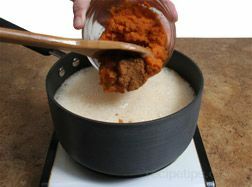 Once the mixture comes to a full boil, add the pumpkin, cinnamon, and pumpkin pie spice. Bring back to a full boil and turn the heat down to medium; be sure to maintain a rolling boil. 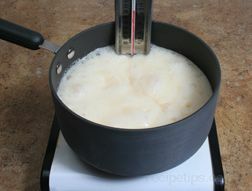 Boil until the mixture reaches 234°F on a candy thermometer. Stir occasionally throughout the boiling time. Note: If you do not have a candy thermometer, allow the mixture to boil to the soft-ball stage. Check after boiling for 10 minutes. 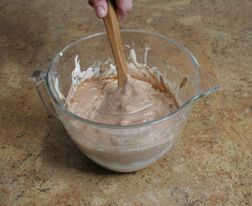 Pour the hot mixture into the bowl with the white chocolate chips, marshmallow creme, and vanilla. Do not scrape the bottom or sides of the pan when pouring into the bowl. Stir together until the chips are melted and all the ingredients are evenly mixed. 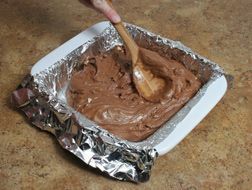 Remove the fudge from the pan by lifting it out using the excess foil on the sides. Flip the fudge over and place it on a cutting board top side down. Peel off the foil. Cut the fudge into the desired size squares. Store in an airtight container. After making your creamy delicious fudge you are going to want to make sure that you store it properly. Before storing be sure the fudge has cooled completely at room temperature. Do not cover the fudge while it is cooling. See the information below for proper storage. Place the cooled fudge in an airtight container. It can be placed in a plastic container, a tin, or in a plastic sealable bag. 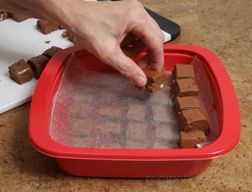 If you are going to layer the fudge, be sure to place a piece of waxed paper or parchment paper between the layers. 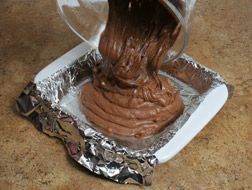 The fudge can be stored in this manner at room temperature for up to 2 weeks. If stored in the refrigerator it can be kept for up to 3 weeks. For extended storage time, the fudge can be frozen. 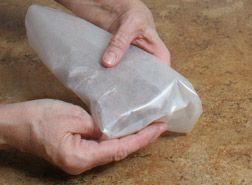 Wrap it tightly in plastic wrap or waxed paper. 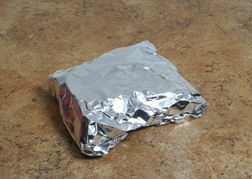 Then wrap again in aluminum foil. 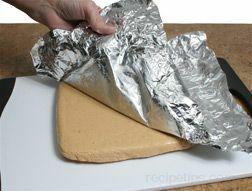 Seal tightly in the foil and then the fudge can then be stored in the freezer for up to 6 months. "I can't thank you enough for this post, last year I tried to make fudge and I threw it in the garbage. Back to conquer this again and failed! I read this article and I am proud to say that I have just tasted a little bit of heaven! Thanks so much. And if anyone is reading this DO NOT I repeat DO NOT be cheap about the candy thermometer I found one at my local grocery store for 14.99 well worth the investment"
"I had never made fudge before and didn't know you had to be so fussy when making it. This information had some very helpful tips and it was nice to be able to see the step-by-step instructions. It was all very helpful to me."